Most people don’t find the idea of cooking a hard boiled egg to be that difficult; however, they quickly find the execution to be more complicated than envisioned as they often find eggshells clinging to the flesh of the egg like a Kardashian clinging to illusions of relevance. Meanwhile, the interior surrounding the yolk may turn unappetizing green. With a few simple steps, these frustrations can be minimized if not completed avoided. The most important thing to consider is how fresh your eggs are. Believe it or not you want eggs to be 1+ weeks old to make easy to peel boiled eggs. Why? As eggs age an air pocket will grow larger inside the shell. As this air pocket forms the membrane underneath the shell will separate from the shell itself. This will prevent the shell and egg from sticking when you peel the final product. Though it may also cause an egg to float in the pan, but that doesn’t necessarily mean it is too old. Once you have your eggs you will want to fill a pot with a few inches of cold water, enough to cover a single layer of eggs. This water should be salted and a teaspoon of vinegar should be added. Why? Adding salt and vinegar will prevent excessive egg whites from leaking out should the shell crack during cooking. Now gently add your eggs in a single layer in the pot. If you just drop them in they will crack and adding them in a single layer ensures they cook evenly. Next cover the pot and bring to a boil. As soon as they boil remove the pot from the heat, but keep the lid on. This will trap the heat inside while the eggs continue to cook. For soft boiled eggs, let sit in the hot water for 4 minutes. For perfectly hard boiled eggs let sit for 14 minutes. Personally, I like my yolks to be slightly soft so I remove after ~10 minutes. 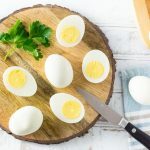 If you boil the eggs for too long or let them sit for too long in the hot water, the area around the yolk will turn an unappetizing greenish gray color. The hard-boiled eggs are still perfectly fine to eat but they don’t look very nice. As mentioned, I find 4 minutes to be the ideal time for cooking soft boiled eggs, however, this can vary from kitchen to kitchen. If you add too much water it will take longer to boil, cooking the eggs more as it heats. 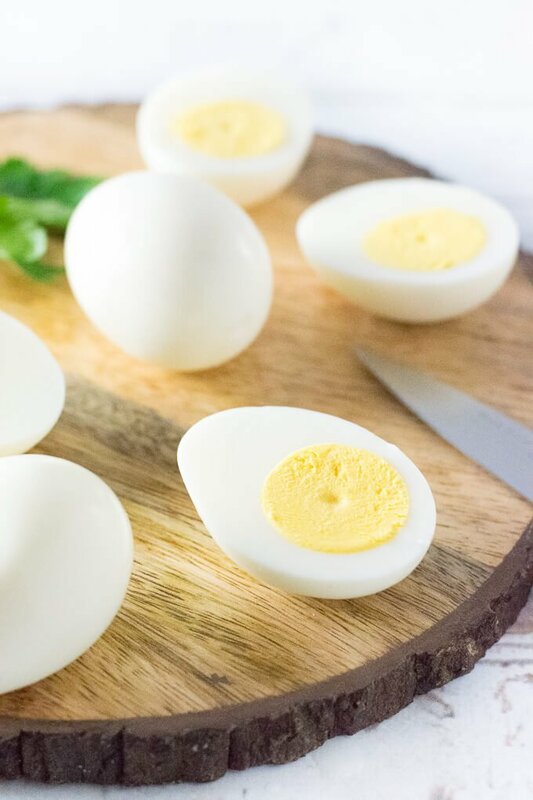 If your soft boiled eggs are firmer than you desire, add less water to the pot next time or let the eggs sit in the hot water for a shorter period of time. Once the eggs have finished boiling, remove them from the pot with a slotted spoon and immediately place in a large bowl filled with ice water. The ice water will shock the eggs causing the membrane to retreat from the shell and allow you to peel them easier. This also serves the dual purpose of cooling down the eggs faster so you can sooner eat one! Tip: The longer you let the eggs cool in the ice water, the easier they peel. As for peeling, I give them a tap against the counter to crack the shell then I peel it under running water. The water helps slip between the shell and membrane for easy removal. Tip: If your egg is proving difficult to peel cleanly, try slipping a spoon in-between the shell and the egg and rotate the spoon to separate the two. 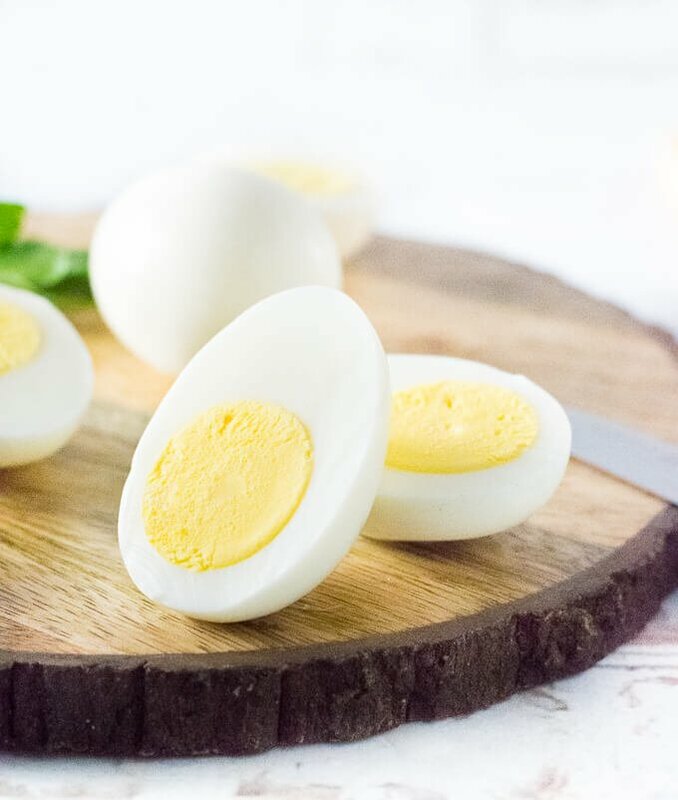 Hard boiled eggs are great to eat on their own with a little salt and pepper, a dab of hot sauce, or a dusting of your favorite seasoning blend. However, there are a lot of great recipes you can incorporate hard boiled eggs into. If you are looking for inspiration, try making my Classic Egg Salad, or the healthier Avocado Egg Salad. Otherwise boiled eggs make a fantastic addition to Ham Salad as well! Fill pot with a few inches of water, just enough to cover the top of eggs. Add ~1 teaspoon each of vinegar and salt. Gently place eggs in a saucepan in a single layer. Cover pot with lid and bring to a boil. Remove pot from heat as soon as water boils and start a timer. 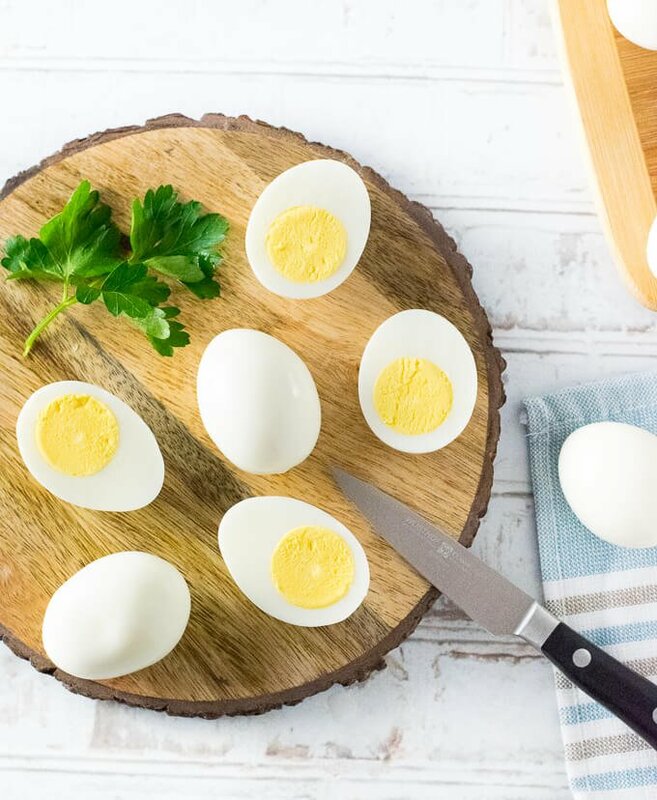 For soft Boiled Eggs – Let the eggs sit in the how water for 4 minutes. 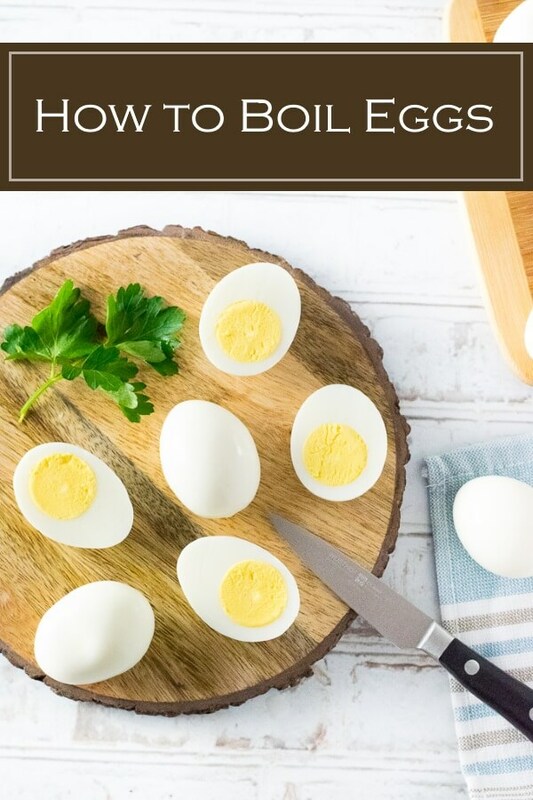 Hard Boiled Eggs – Let stand for 14 minutes. Remove eggs from pot with a slotted spoon and place in a bowl of ice water for at least 5 minutes to cool. Peel eggs under running water. IF YOU LIKED THIS RECIPE check out my Chicken Liver Pate as well, it is my grandma’s recipe! 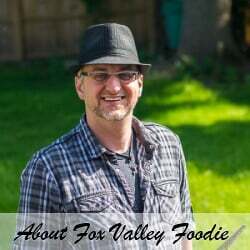 This recipe was originally published on FoxValleyFoodie.com November 19, 2014. If you enjoyed reading my Smoked Beef Roast recipe then you should probably like me on Facebook and follow me on Pinterest too. That’s what I would do at least, and if you are willing to take my advice on the food you put into your body you should probably follow my advice on that too. After draining hot water I gently crack the large end of egg, and then put into cold/ice water to cool before peeling. This also helps the shell to be removed easier- often without running water while peeling. Thanks, that is a great tip. I look forward to trying it! I use a steamer basket to hard cook eggs. That makes it very easy to lift all the eggs in and out of the boiling water at the same time.